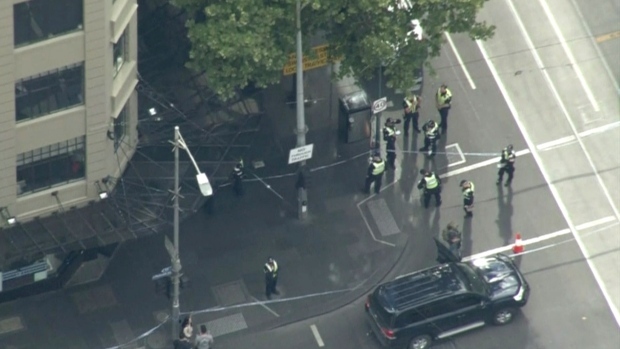 Melbourne was also the scene of two fatal car-ramming incidents a year ago, but neither was linked by police to terrorism. The vehicle burst into flames before a man emerged and began attacking people in the street, police said. Police shot the man when he approached officers swinging the knife. The three stabbing victims, one dead, were all men. I praise the bravery of the police who were on the scene and took action and those who selflessly came to the assistance of the injured and provided comfort to the distressed. Two other victims are now in hospital. Another man tried to ward him off with a traffic cone. Witnesses then described that the police attempted to disarm the man with the help of two witnesses as the suspect kept lunging at them. The deceased terrorist reportedly drove a vehicle into pedestrians outside a local mall, the auto later burst into flames "exploding" and several people were stabbed by the unidentified male, who is known to authorities and has links with known terror plotters according to the Herald Sun. A bomb squad rendered them safe without any exploding. Victoria Police are urging any witnesses to the incident to attend Melbourne West Police station to give a statement, or alternatively upload any images or videos from the incident to the Victoria Police facebook page. He sprung back into action and charged back towards the attacker, shoving the trolley back in his direction as police opened fire.